October 01, 2009 Frontier Airlines Holdings, Inc. announced today that Republic Airways Holdings, Inc. (NASDAQ: RJET) has completed its acquisition of the Company. Upon the closing of the transaction, Frontier Airlines Holdings, Inc., Frontier Airlines, Inc. and Lynx Aviation, Inc. successfully emerged from Chapter 11 bankruptcy and are now wholly owned subsidiaries of Republic. Frontier Airlines and Lynx Aviation will continue to operate under their same names, offering the same flight schedules, customer amenities and frequent flier benefits as in the past. “This is the end of a long, difficult journey and the beginning of a new, exciting one,” said Frontier President and CEO Sean Menke. “My thanks go to our Frontier and Lynx employees whose hard work and sacrifice enabled us to successfully restructure our Company into an incredible success story. Frontier Airlines, Inc. is a low-cost airline headquartered in Denver, Colorado, United States. The carrier operates flights throughout the United States, Mexico, and Costa Rica. Frontier is a major low-cost airline with two thirds of its US destinations west of the Mississippi River. The carrier maintains its sole hub at Denver International Airport, and provides regional service to the surrounding Rocky Mountain States through a code-share agreement with Great Lakes Airlines. 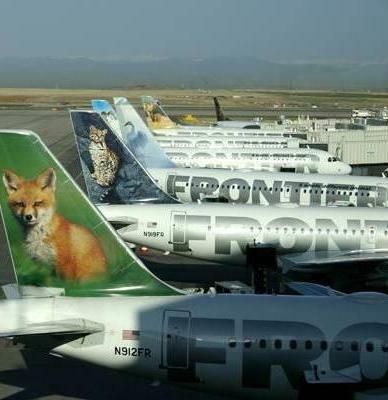 Frontier is not a member of any of the major air carrier alliances. In March 2007, Republic Airlines slowly began replacing Horizon Air as the operator of their feeder service, Frontier Airlines operated by Republic Airlines; Frontier JetExpress, which was operated by Horizon Air, ceased operations on November 30, 2007. In April 2008, Frontier and Republic terminated their agreement and Republic withdrew its aircraft from Frontier service on June 23, 2008. On April 10, 2008, Frontier announced that it filed for Chapter 11 bankruptcy due to its credit card processor, First Data, attempting to withhold significant proceeds from ticket sales. First Data decided that it would withhold 100% of the carrier's proceeds from ticket sales beginning May 1. According to Frontier's press release, "This change in practice would have represented a material change to our cash forecasts and business plan. Unchecked, it would have put severe restraints on Frontier's liquidity..." Its operation continues uninterrupted, though, as Chapter 11 bankruptcy protects the corporation's assets and allows restructuring to ensure long-term viability. On June 22, 2009 Frontier announced that pending court approval, Republic Airways would become corporate parent of Frontier. However, on July 30, 2009, Dallas-based Southwest Airlines announced that it would be making a bid for Frontier during a bankruptcy auction in August. On August 13, 2009, Republic Airways Holdings acquired Frontier Airlines and Lynx Aviation as wholly owned subsidiaries.